DUBAI, Verenigde Arabische Emiraten–(BUSINESS WIRE)– Het ministerie van Buitenlandse Zaken en Internationale Samenwerking heeft in samenwerking met de Wereldbank en zusterorganisatie International Finance Corporation het Women Entrepreneurs Finance Initiative (We-Fi) gelacneerd. Dat gebeurde op dag twee van de zesde World Government Summit (WGS 2018) in Dubai. 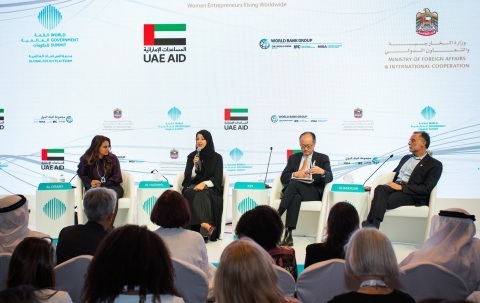 DUBAI, United Arab Emirates–(BUSINESS WIRE)– The UAE Ministry of Foreign Affairs and International Cooperation in collaboration with the World Bank and its sister organization, the International Finance Corporation, launched the Women Entrepreneurs Finance Initiative (We-Fi) on day two of the sixth World Government Summit (WGS 2018) in Dubai today. His Highness Sheikh Hamdan bin Mohammed bin Rashid Al Maktoum, Crown Prince of Dubai and Chairman of the Dubai Executive Council, launched Dubai 10X 2.0, phase two of a project that aims to place Dubai 10 years ahead of other cities by calling on all Dubai government entities to embrace disruptive innovation. Some 26 creative initiatives across fields as diverse as energy, education and logistics, proposed by local government entities, will be implemented over the next 24 months. The first phase of Dubai 10X saw the launch of 160 projects in 2017. In line with its drive to make Dubai one of the smartest and most sustainable cities in the world, the Dubai government also announced its plans to launch a new satellite to monitor and collect data on the UAE. The satellite will evaluate various environmental factors, such as marine conditions and air quality.